Pikmin and its sequel were two of the GameCube’s most beloved titles. But over the lifespan of the Wii, no new games were released in the series. Now, after nine years of anxious waiting, the cute plant-creatures are back and on the Wii U. And while it’s a little rough around the edges, it is indeed a true Pikmin game. If you have played either of the previous Pikmin games, you know what to expect in Pikmin 3. You land on a planet, befriend the Pikmin and set to work picking flowers, defeating monsters, solving puzzles, and finding food. 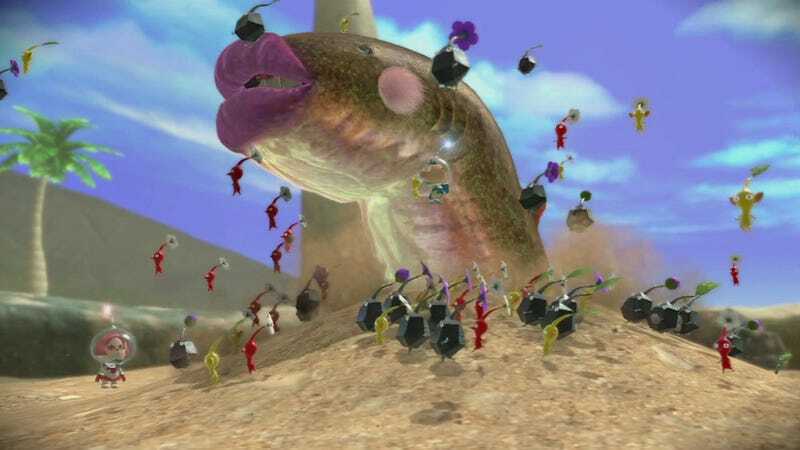 As you find new types of Pikmin, you are able to reach previously inaccessible areas, defeat new monsters, and progress through the story's plot. It's a game that's half RTS, half puzzle. There are five types of Pikmin in Pikmin 3. Three return from the past games—the red, blue, and yellow varieties. The other two types—rock and flying—are new. Each species has several unique qualities that make it better suited for some tasks than others. Blue Pikmin can breathe and fight underwater, while reds are stronger fighters and are fire resistant. The special ability of the new rock Pikmin is that they can be used as bludgeoning objects. While they can't be thrown as far or as high as other Pikmin, they do far more impact damage when they hit a target. They can also be used to break crystal to unlock new areas or discover secrets. The flying Pikmin’s uses are rather self-evident: They can fight flying enemies and carry objects across water. Moreover, as they can follow you when you wade through water into a new area, they are vital in the time before you get the blue Pikmin. In the first Pikmin game, you control one character. In Pikmin 2 you control two. Following this pattern, it is no surprise that Pikmin 3 gives you three characters. Luckily, what results is more than just a numerical gimmick. While the three characters play identically, they allow you to split your group into three and tackle several objectives at once. More than that, the three-character feature is incorporated into a large number of the game’s puzzles, as you are forced to throw one of your other players into an otherwise inaccessible area. Sometimes, you are forced to do this twice, creating a chain of characters throwing Pikmin from one to the other. In Pikmin 3, each day lasts about 15 real-world minutes—after which time you are forced to evacuate the area. This is generally enough time to get something positive done—i.e., finding fruit or opening a new area. However, the bosses, while generally beatable in that time, can easily take longer if you're just seeing them for the first time. Luckily, the game does not penalize you for having to leave mid-boss battle and the boss' life bar remains unchanged when you return the next day. However, you do lose a day's ration of fruit juice at the end of each day regardless—which, in the early days, makes finding fruit your top priority. But as for the long run, there is about 100 days’ worth of juice you can get by solving all the puzzles and finding all the fruit scattered across the world. In comparison, it only took 37 days to beat the main game. But in the event you feel like you wasted a day—even a day a few days back—you can always reset to any previous day in your game as Pikmin 3 creates a permanent autosave after each day is completed. So while you are always under a time crunch, it is a forgiving one. Simply put, Pikmin are dumb. Often too dumb to live. They will follow you blindly into a lake even if that means their deaths. If you walk around the edge of the lake, the slower among them (the rock types) will happily take a lethal bath in order to try to catch up. If you stop on a small platform above a lethal drop, your army will group up around you, eventually pushing those on the outsides off the platform to their deaths. And that's not even mentioning the scores of them that will get trapped on corners and just continue to walk into a wall until you return to gather them. On one hand, this means the game is always keeping you busy managing your Pikmin—even when they are not solving puzzles or fighting battles. On the other, it makes even a leisurely walk feel like baby sitting. I played the entirety of my first Pikmin 3 playthrough using the Wii U's gamepad. While it worked well enough most of the time (though it felt like I was playing a game designed to use only one thumbstick), in battle it was a major hindrance. In the boss battles especially, it is imperative that you lock onto your target quickly and easily so you can get to chucking Pikmin. Sadly, you can only lock onto a creature when your throw arc intersects it—which means you need to be close to the target and facing it even as it moves about—and this can be a nearly impossible feat. Moreover, you have no control over the vertical camera; so when it gives you a near horizontal angle, aiming becomes even harder. Thankfully, employing the Wiimote instead of the gamepad does a lot to combat these issues by using the motion controls to aim and the thumb stick to move. In fact, the only real downside is that the Wiimote controller layout relegates camera control to nothing beyond being able to center the camera behind you—though that’s a fair price to pay for a much better control scheme. Pikmin 3 is a game that doesn't try to re-invent the wheel. For better or worse, it sticks to the formula of past titles and has just enough tweaks—like three characters or two new types of Pikmin—to keep it from feeling stale. It does have its problems here and there with the camera, controls, and AI, but for the most part is an enjoyable ride. If you liked past Pikmin games or enjoy the idea of a light puzzle/RTS hybrid, Pikmin 3 is probably the game for you.